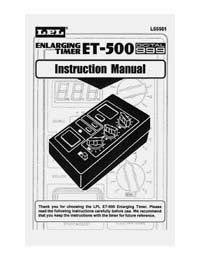 This manual has been revised to provide clear and complete instructions for set up and operation of the LPL ET-500 Digital Enlarging Timer. Covers North American, European, and Japanese models. 5½" x 8½" format. Staple bound. 8 pages.